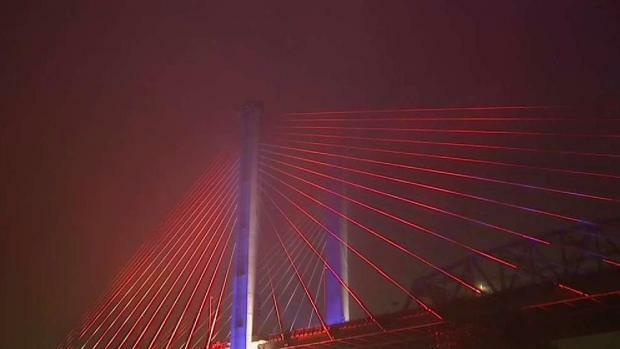 The first span of the new Kosciuszko Bridge opened Thursday, but Friday marked the real test of the new overpass. It turns out the new bridge, which links Greenpoint, Brooklyn, to Maspeth, Queens, isn't fully open yet. Five of the six lanes were open on the new span Friday morning, though the governor's office says the hope is get all six lanes open by Monday. In the meantime, one lane on the old bridge -- which is set to be demolished soon -- was still open Friday. A News 4 crew crawled along the lane over that bridge as it headed toward Brooklyn during the morning rush. This all comes after fanfare surrounding the opening of the bridge Thursday. Gov. Cuomo drove the ceremonial first car, a 1932 Packard belonging to Franklin Delano Roosevelt, over the new Kosciuszko Bridge, which is the first major one built in New York City in 53 years. There was also a dazzling light show to music later in the night, and the bridge glowed every color of the rainbow as a heavy fog rolled by. The show was the first performance of "The New York Harbor of Lights." Eventually, seven other MTA-operated bridges will have LED lights that change color and synchronize to music. 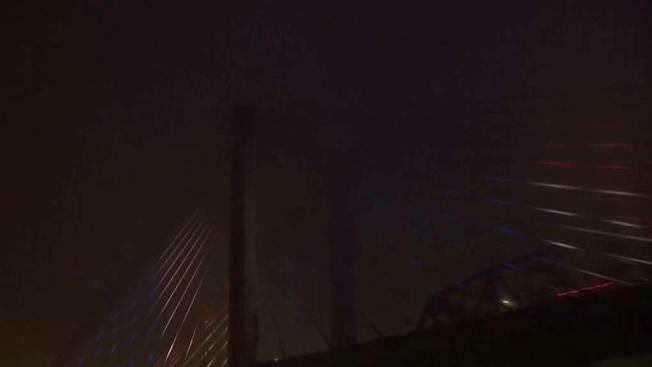 The bridge opened to traffic at 10:30 p.m.
An estimated 185,000 vehicles cross the rusting 78-year-old bridge every day. Cuomo says it was built for 10,000. For decades, drivers have had to endure miserable traffic tie-ups on the old bridge. Now traffic will be diverted to the new span, and when the bridge is completed in 2020, there will be two spans, one going in each direction. Getting the bridge built wasn't easy. It took years of construction and a $500 million price tag. But Cuomo promises it will ultimately reduce traffic.